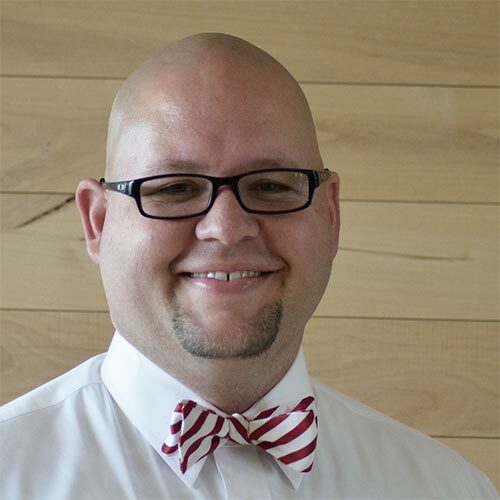 Eric Roberts is an architect from Las Vegas, Nevada with a penchant for sketching daily. 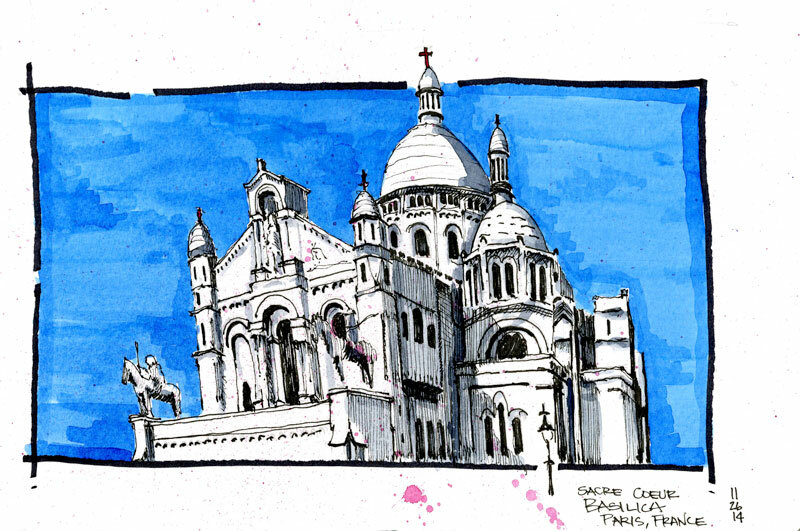 The sketches in this post all come from his sketchbooks on his many travels. 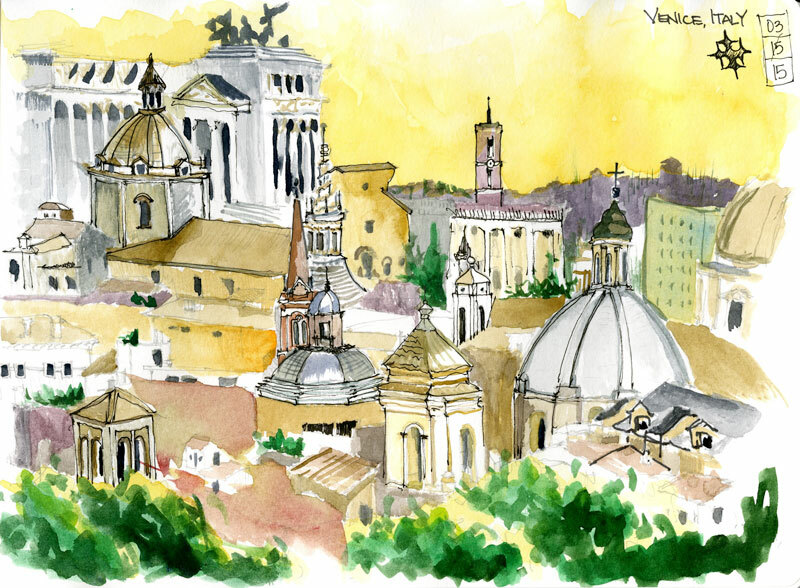 He is a proud member of Urban Sketchers and his favorite architect is another sketch artist, Renzo Piano. What do you like about getting outside and sketching? Sketching is something akin to meditation for me. In all the chaos of the world that we live in as parents, spouses and employees I look to sketching as a refuge from the uncontrollable. There is solace to be found in the delicate control of a line, or a tone and the way that a composition comes together. I started a Las Vegas chapter of the UrbanSketchers because I found that I was only taking the time to sketch when I was out of town. This left me with a great sketchbook full of places around the globe, but no real knowledge of my own city. I love getting out and sketching a new place, each time that I do I learn something that I didn’t know about that locations. Sometimes when I am sketching my hands and my brain are separated and doing different things; for instance, my mind may be working on a troublesome problem from home or work while my hands interpret what my eyes are seeing. Sketching on location is also a way to triage our environments. 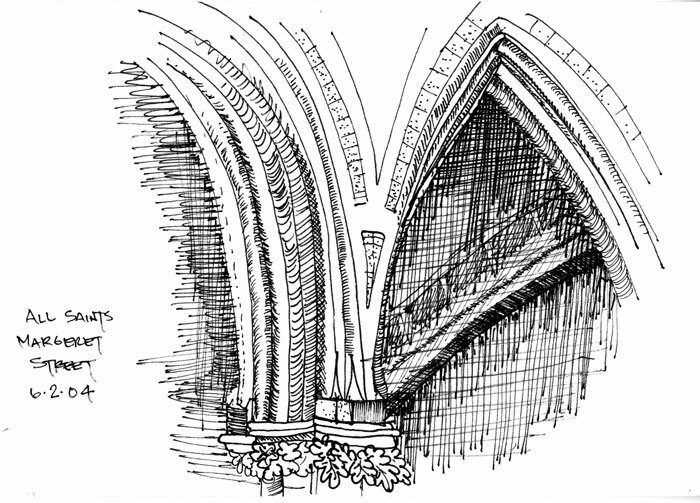 A sketch is a single selection of many personalities that any specific building or place may choose to portray. As a sketcher I like to go back and look at the work that I did and remember very clearly why that view was selected or why a certain color palette expressed the feelings that I had about the place. What do you take with you on-location and what do you add when you get back to your desk? My on-location kit has evolved over time. I have attached a picture of the sketch materials that I carry with me every day… it is probably more than I need. 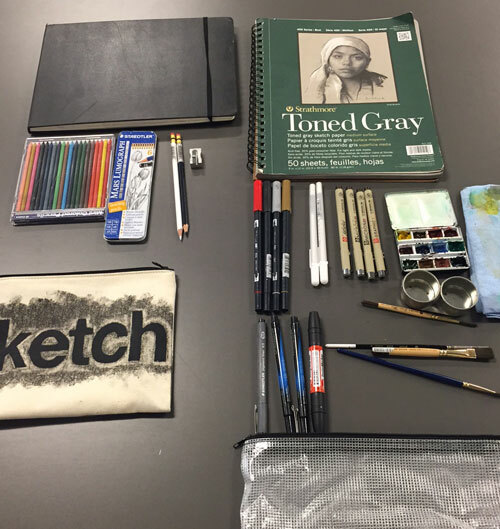 My kit includes: 2 sketchbooks, portable water color kit and water containers, two “art kits,” one kit for pencil and the other kit for ink and water color. I prefer to sketch and watercolor in one setting, so it is nice to have those materials with me on site. 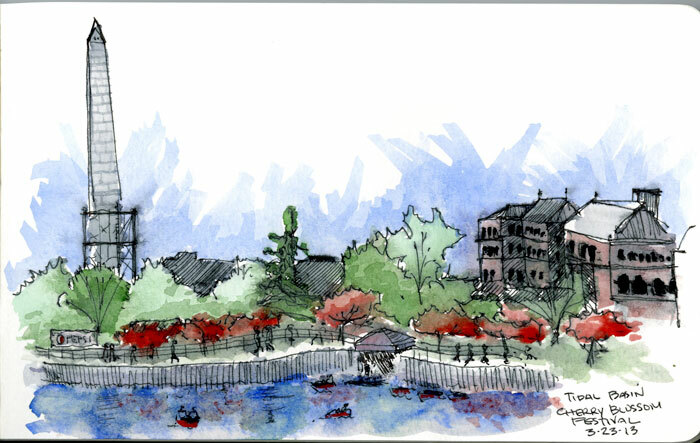 Oftentimes, however, I will complete a sketch on site and then apply the color at another time. Regardless of where the color is added, I can never leave a sketch and say it is complete without getting all the shadows and light properly located on the sketch. I suppose that is a little bit of OCD. Some of my sketch materials are for methods that I have learned from viewing other sketchers and trying to replicate a technique that I really enjoy from their work. The red markers and white gel pens are for a technique I learned from a sketcher in the Philippines. Explain Urban Sketchers. 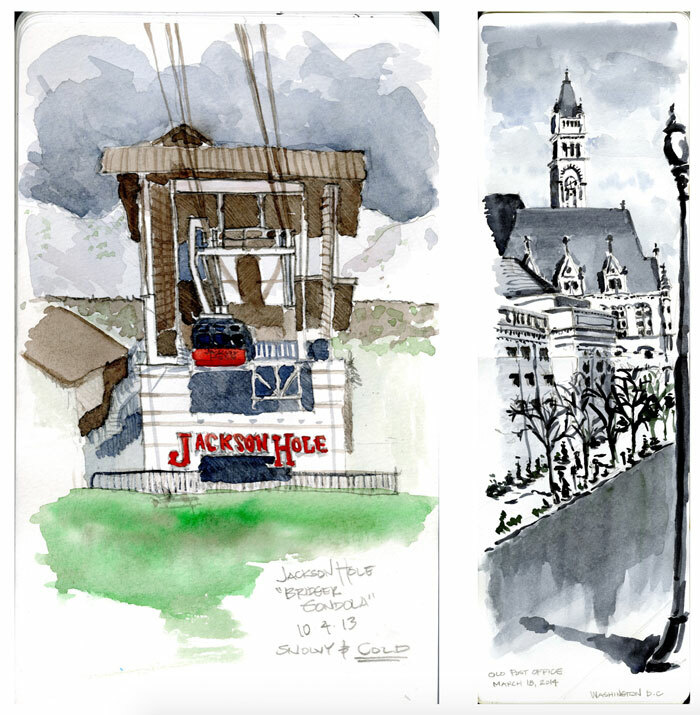 Urban Sketchers is a global community of sketchers that endeavors to experience the world one sketch at a time. 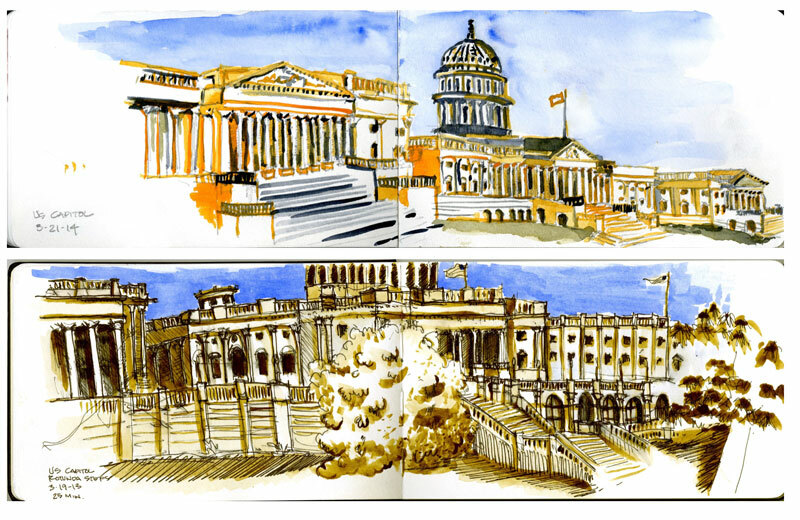 I was introduced to Urban Sketching by one of my professors at the University of Idaho. He was on the original group that started the organization and he teaches at the annual conference every year. His philosophy was to draw something every day – to draw the best composition, no matter where that composition could be found. It wasn’t until I was a college student that I really caught the bug for sketching the world that I was experiencing. Now I have sketchbooks full of material and it has really become something I look forward to every week. Follow Eric Roberts on Instagram.